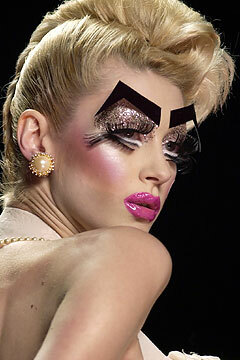 Glam rock wouldn't be glam rock with out its infamous make up. 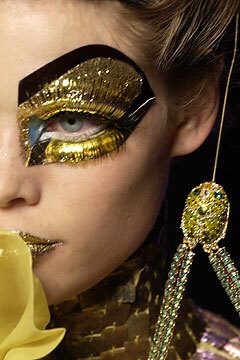 So when it came to crowning the glam rock make up Queen - (no Kings) it wasn't hard, Pat McGrath won it hands down. Famous for not wearing any make up herself, McGrath is one half of the most deadliest fashion couples ever. 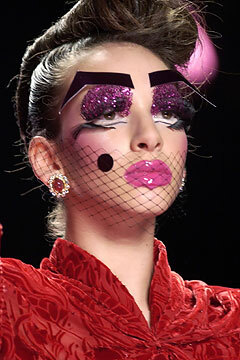 Yep she works with Galliano , what a match made in heaven. I would love to know how these two met. during the shoot last weekend I met a lovely & very talented make up artist who has her own blog so if you want make up tips then click over to lash out loud. WOOOOOOOOOW that makeup is amazing! imagine having to put that on every morning? :P i run out of time for eyeliner and mascara!